Barry Bonds reached 756 and many, myself included feel, that something is amiss. Yet one of the criticisms is that he began to improve in his mid-30s. My hardest routes/problems were done in that timespan and I feel there is considerable room for improvement yet, after 30-odd years of climbing. Is there something to be said for longevity in a sport? I think so. The steroid/doping scandals in the news this summer seem to speak to a dissatisfaction with how we reward the "winners" in our society. What do they really deserve? In climbing there are no real rewards for winners--free shoes anyone?--so the attitude towards cheaters is generally very scornful but no one's going to trial or answering questions from ESPN. Adam Ondra, 14 of the Czech Republic, managed a likely 14d in three tries one week and then, next week, in a day redpointed Silbergeier, a six pitch 14a in Austria. 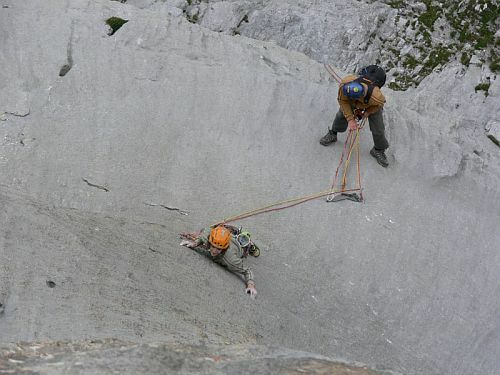 This is a route with serious runouts in an alpine setting, requiring a cool head and real rock sense. Amazing. Silbergeier has seen relatively few ascents while the previous ascent of Abysse, the 9a, took over two weeks of tries, both done by solid, respected names in the sport. Is there any other sport that sees young athletes reach such an incredible peak so quickly? Women's gymnastics is the only contender I can think of and seems much more subjective in nature. Anyone can try a hard route and see for themselves what's involved physically but we can never revisit a gymnastics meet or second-guess the judges. So what is the factor that allows climbers to move forward so quickly? Or even "old climbers" to climb levels/routes thought impossible when they started?